Start your day with early morning pickup from your Alice Springs hotel, then travel about two hours by air-conditioned 4WD coach through the West MacDonnell Ranges. Throughout the day expect informative commentary about the geology, as well as the plant and animal life in the area, from your guide. Stop to stretch your legs in the heritage-listed Hermannsburg Historic Precinct, then continue into Finke Gorge National Park. After morning tea in Palm Valley, which is located in the park, hop back in your 4WD vehicle. 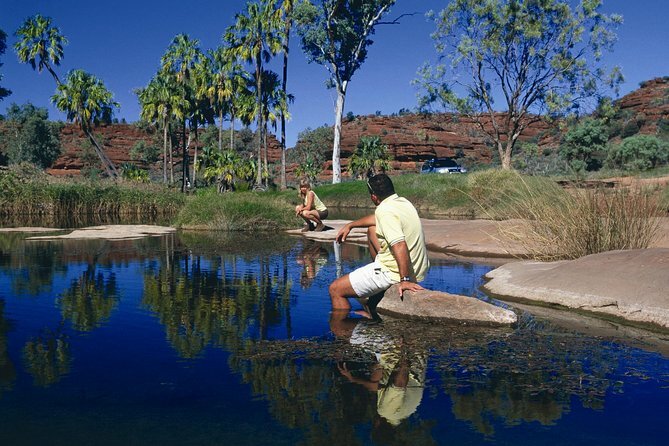 Follow the Finke River along a sandy track that is surrounded by spectacular rock formations. Palm Valley is named for the some 3,000 red cabbage palms found only here. See the trees in addition to other species of cycads and palms on a guided walk. From there, the 4WD vehicle takes you to Kalarranga Lookout. Hop out here for another guided stroll of less than a mile (1.5 km). Panoramic views of sculptural sandstone hills, rugged cliffs and natural stone towers create some great backdrops for photos. Return to the Hermannsburg Historic Precinct where you can enjoy a ploughman’s lunch (think cheeses and bread). German Lutherans established Hermannsburg in 1877, making it the first Aboriginal mission in the Northern Territory. After lunch, stroll through historic Lutheran mission buildings and learn about the importance of this area to the Western Arrernte Aboriginal people. One of the most interesting local history lessons takes place at the home of the late Albert Namatjira, an acclaimed watercolor artist who lived in the mission. You'll also get to see his art in the local art gallery. In the late afternoon, board your coach for the drive back to Alice Springs. Your tour ends with drop-off at your Alice Springs hotel in the early evening.